Successfully Added LED Bicycle Light Set to your Shopping Cart. 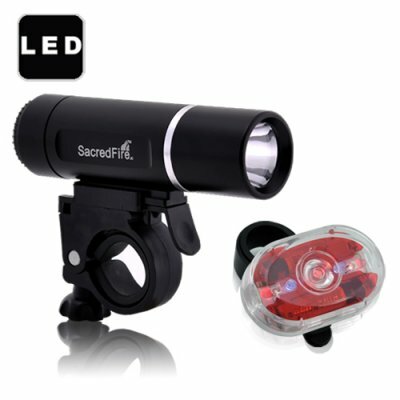 Notify drivers and other cyclists of your presence with this Super Bright LED Bicycle Light Set. Equipped with a super-bright white LED for the front and a clear red LED for the rear, this light set ensures high visibility to other road users and is ideal for all-round safety precautions. Riding at night can be risky, but the dangers of the road can be nullified with this Super Bright LED Bicycle Light Set. The front white LED will both light up the path for any hazards and announce your presence to incoming traffic, while the rear red LED will alert vehicles of your location so they know to avoid you. So what other features makes this Super Bright LED Bicycle Light Set the ideal choice for you? -Easy to install: The quick release clamp holder will fit just about any bicycle model and bicycle part, so clip it onto the handle bar, seat post mount, frame, anywhere! -Durable: The sturdy alloy construction and ultra-compact weatherproof case is also backed by a 12-month warranty, making sure you get only the highest quality. -Budget price: For a ~$10 light that could easily save your life, this Super Bright LED Bicycle Light Set is an immediate must buy for anyone worried about bike riding safety. Click on "Add To Cart" right now and we will express ship yours out tomorrow - guaranteed! Can I use the front white LED light as a stand-alone flashlight? Of course, it is easily detached from the mounting accessory so you can use it as a handheld flashlight. How long will the LED light bulb last for? Our LED light bulbs are known to have a 100,000 hour bulb life.